I am not normally one for group shots and I find the theme of an all woman team difficult to rationalise. Some of the previous works I have read seem to dedicate this kind of comic for female readers, but I have never found them to be written that well. At times there are clear male traits written for a woman, and it emanates the feeling of a token gesture. 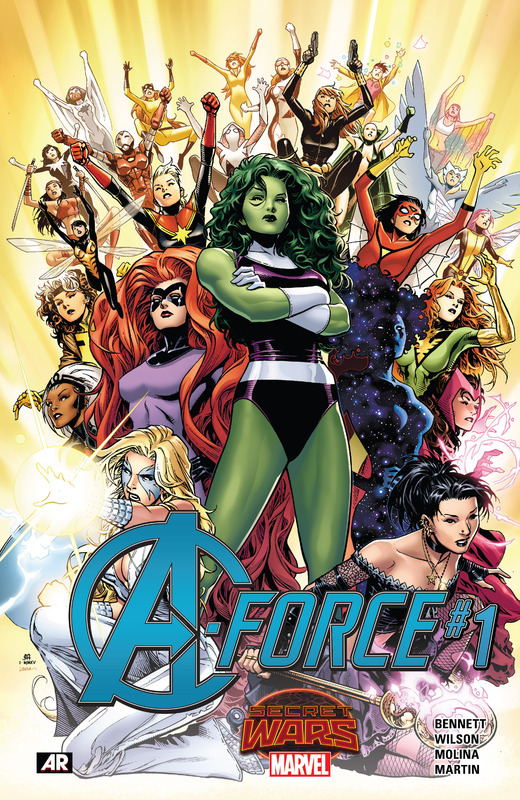 That being said, this book is completely different to that because there are reasons why A-Force should exist from the perspective of the story. Therefore this cover makes complete sense and shrugs off my cynical mind, allowing myself to discuss the beauty at hand. Group shots are difficult but there is some lovely touches here that makes it stand out and look very beautiful. There is certainly a degree of symmetry at hand with a clear central leader, and a formidable one she is. Shulkie is a great leader from her personality to her general aesthetic, she is a commanding figure, beautiful and wears the green with pride and without shame. The green colouring complements the yellows that the images faded into. The surrounding characters appear to take prominence the closer they are to her but they are still instantly recognisable. The symmetry is maintained with Dazzler and Nico in posture but also in colour, one being blond haired in white and the other black in black. The epic hair of Medusa is complemented by the starry look of Captain Universe (at least I believe that is her) and both Jess and Carol form similar poses. It is here that the colouring become even more clever because there is a yellow tint to the remaining characters that allow the scene to merge into the background effortlessly. The whole page looks glorious and mighty, and as a superhero team works on so many relatively unique levels. The aesthetic appeal of the cover lends to its prominence on the shelf and I hope many more people will pick it up. Previous PostDescender #3 – But where do all the toasters go?